Our August, 2017 newsletter will be available online at Dr. Krohse's Blog. If needed, please use the links in the footer to opt out or change your account. 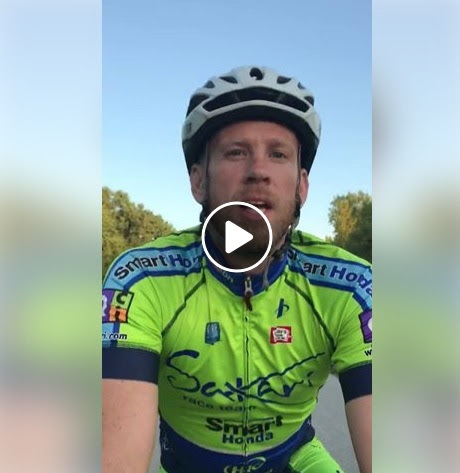 Suffer Less Cycling Workshop - Tuesday, Sept. 5 at 6:30 - FREE - RSVP through the event link below! Late June and July have been HOT! So hot that my dog has been getting shortened walks every day. 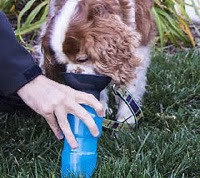 I had to find an easier way to bring along water on walks and found the Aqua Dog Water Bottle. It's a portable water bottle that holds 18 ounces of water. On the top of the bottle is a small drinking bowl that is attached and the bowl is filled with water by gently squeezing the container. It looks similar to a regular water bottle and has a handy velcro strap so it can be attached to a belt loop or wrist which frees both hands for walking. 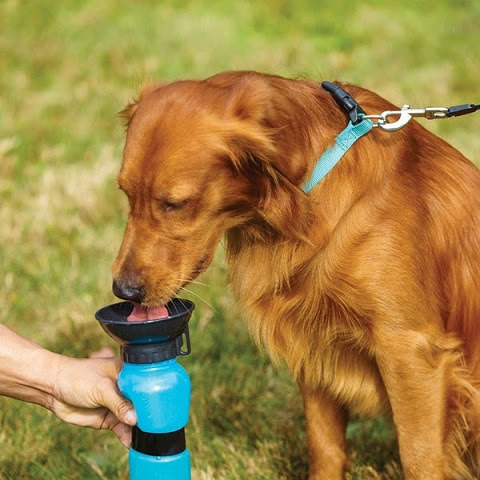 We have found this very helpful with much less hassle for bringing along water on long walks (or short walks in this heat!) And it's much easier for our dog, Bella, to take in water. I found mine at Bed, Bath and Beyond ($12.99) but I have seen them at other retail stores and online. 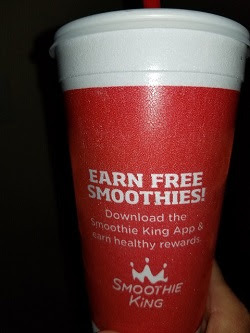 I have recently discovered Smoothie King that is located on Mills Civic Parkway. I fell in love with them because of their bountiful options and the fact that the smoothies are tasty. They have them categorized as fitness, slim, wellness, and take a break blends. Each category has several flavors and options available. They also have enhancers you can add like energy boost, fiber blend, muscle builder, probiotic, diet down, herbal immune, multivitamin, pure recharge, and super grains. For sizes they carry 20 ounce-small, 32 ounce-medium, and 40 ounce-large. 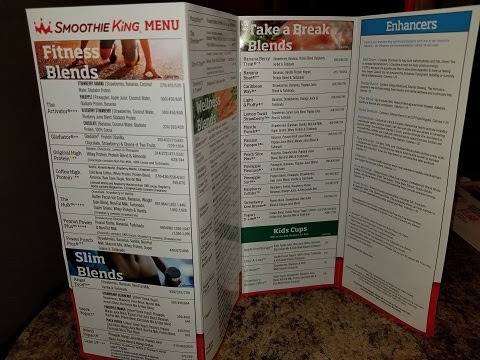 Prices range from around $5.00 to $10.00 depending on the size, type of smoothie and enhancers if you choose. You can also customize a smoothie, so if there is an ingredient in it that you do not want, they will leave it out for you. All smoothies are gluten-free, which also really excited me. You can download their App and earn rewards from your purchases. So far, my favorites have been a Vegan meal replacement called Nutty Super Grain and the refreshing Lemon Green Tea. I also discovered a second location out in Waukee on my way home from a bike ride…SCORE!! 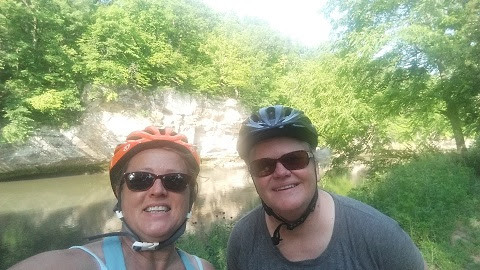 Just what I need after I ride 20 to 25 miles on the Raccoon River Trail. A few years back I had a case of food poisoning that hung around a few days. Eventually, I went into urgent care and asked if there was testing that could be done to find out what was affecting me. They offered to have a stool sample analyzed in a lab and I agreed, thinking it might cost perhaps $150. I got the results shortly after and was glad to hear nothing was found. My body healed and I felt much better, until I got the bill for the lab analysis - almost $500! If I'd known it would be that much I would have probably waited till I was wasting away to nothing! Another time I mentioned to my doctor that I'd been dealing with some chronic, year-round sinus congestion that I assumed was due to dust and mold (but later learned through the Standard Process Purification Program was mainly triggered by gluten). The doctor was a friend and gave me a bag filled with about 8 samples of Flonase and Nasacort nasal steroids. These lasted me for close to a year before I finally went in to fill my prescription. When I got to the pharmacy, I learned that this medicine would run me about $140 for a month's supply! I was flabbergasted! I had assumed the medicines were maybe $30 a month and had no clue that the little bag of samples the doctor had given me had a value of over $1,100! If I won that much money in a contest I'd be doing the Snoopy Dance the rest of the day! Live long enough and at some point you'll get to experience sticker shock at the cost of healthcare in this country. 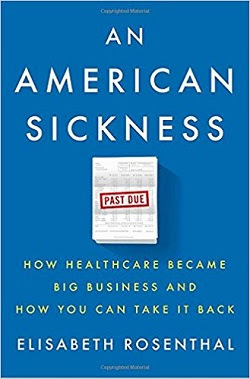 An American Sickness is a fascinating book detailing how our healthcare gradually became incredibly expensive while not providing close to the best results compared to other countries in the world. The book also goes through the action steps you can take as a patient to make sure you don't get surprised with a huge bill that could have been avoided by asking questions and being informed up front. The first section of the book goes through all the individual parts of health care and how they progressed to where we are today. Pharmaceuticals, joint replacements, medical devices, surgeries, hospital services, and more can all cost five to 10 or more times what they would cost in other countries. While you might think this sounds boring, it held my interest at a pretty high level. She gave frequent examples of real patient's surprise experiences, and it provided a lot of jaw-dropping moments as I read ways that trusting patients can end up with gasp-inducing bills because of a system that has changed from a priority on patient results to profits. Reading this section was a bit like watching a horrific scene in a movie... it's terrible to look at but hard to look away. Some of these examples hit close to home, and I thought of stories from patients who have had surprises that they've shared with me. As an example, a while back we had a patient who went to a primary doctor who was in her network which happened to be an HMO. The doctor recommended some specialized lab work and the patient agreed to it. The lab used for the testing was out of network and so the patient ended up with a $2,500 bill that both the lab and her health insurance insisted she was 100% responsible for. With the specific health situation she was dealing with, the stress of a surprise $2,500 bill was the last thing she needed to deal with. The second portion of the book is specific action steps that can save you thousands. You really have to have some knowledge of questions to ask before you end up with a crisis on your hands. In the example above, if that young lady had read the book she would have added an extra note to her initial paperwork in the part where she accepts responsibility for the cost of care that states "I will only accept responsibility for care provided or referred that is performed by an in-network provider" and would have known to ask about the network status of the lab at the time the testing was suggested. I highly recommend this book as an interesting read that can also save you and your family members thousands of dollars if you keep the advice section in mind as you navigate visits with healthcare providers. Personally I listened to it as an audiobook for free through the Des Moines Library's Overdrive App on iPhone.